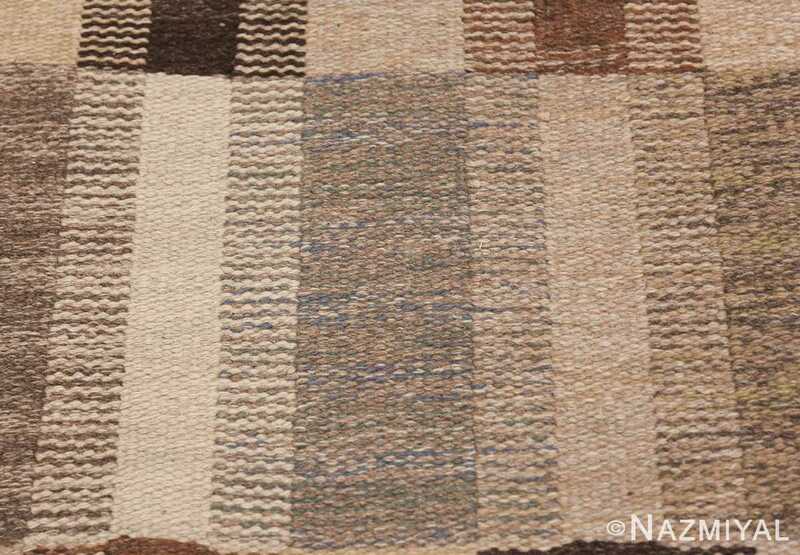 Breathtaking And Extremely Decorative Vintage Oversize Scandinavian Brita Grahn Kilim Rug, Country of Origin / Rug Type: Scandinavia, Circa Date: Mid – 20th Century – This classic earthy tone color flat weave rug is the work of Brita Grahn, a Swedish textile artist and design from the mid-20th century. 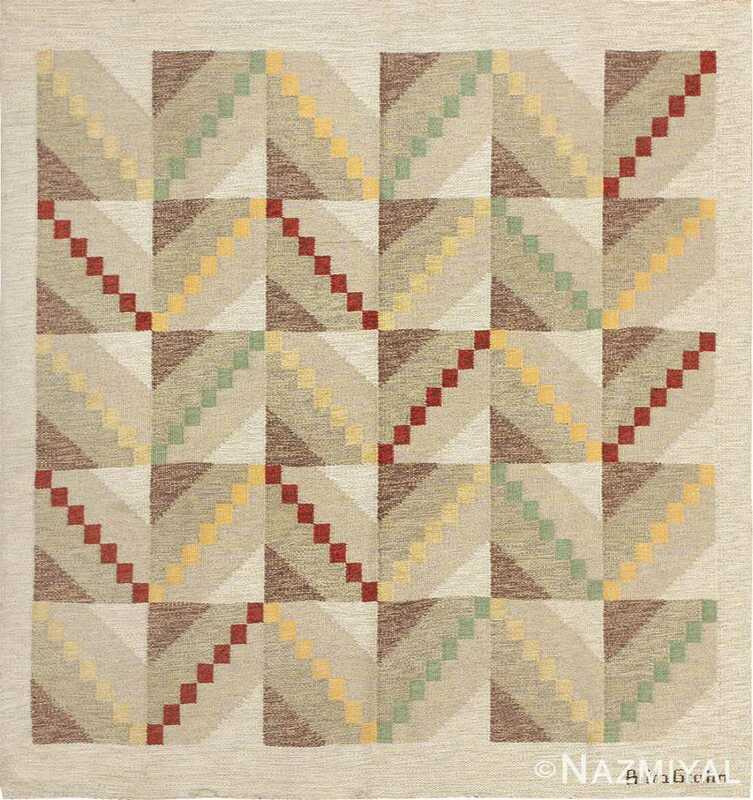 Her rug designs and patterns drew on geometric shapes and repetition, typically with a small border, as the motif for much of her works. 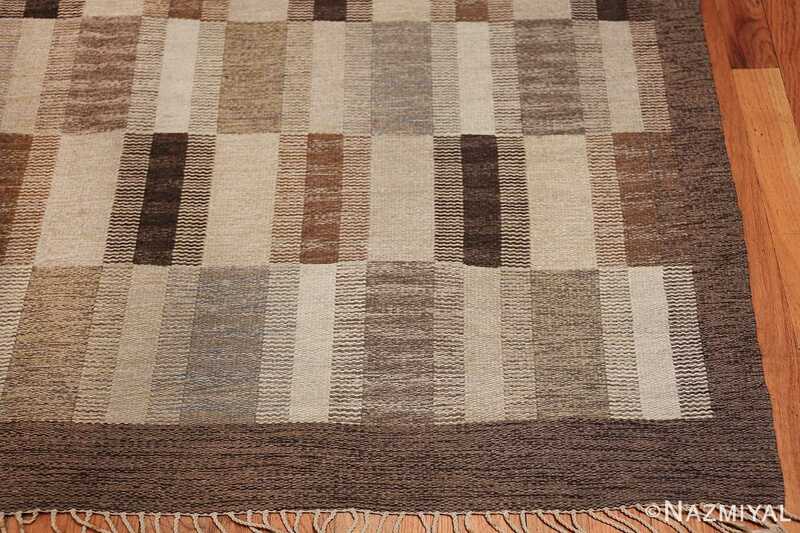 This beautiful vintage Scandinavian rug, using only shades of brown ranging from chocolate to ivory, is an excellent example of Grahn’s work. The geometric shapes are carefully arranged so that the colors form geometric shapes within geometric shapes much like the complex artworks of MC Escher. 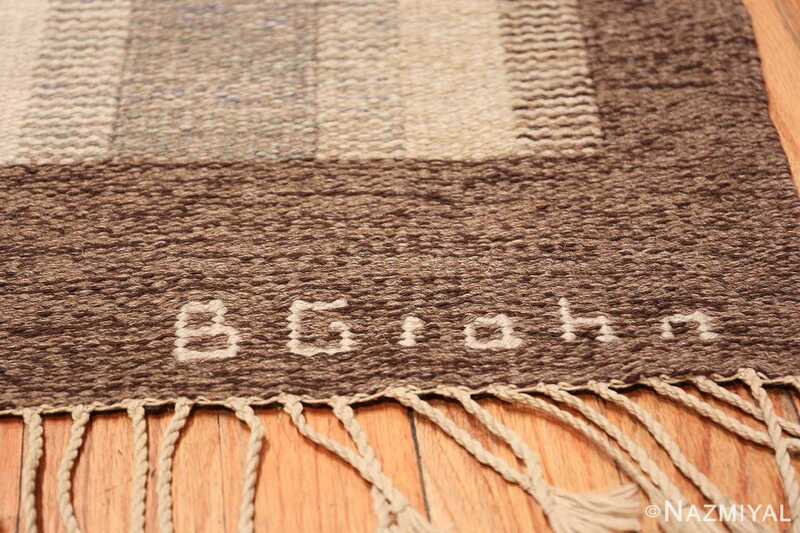 From 1932 to 1940, Grahn had her own textile studio in Uppsala, Sweden. 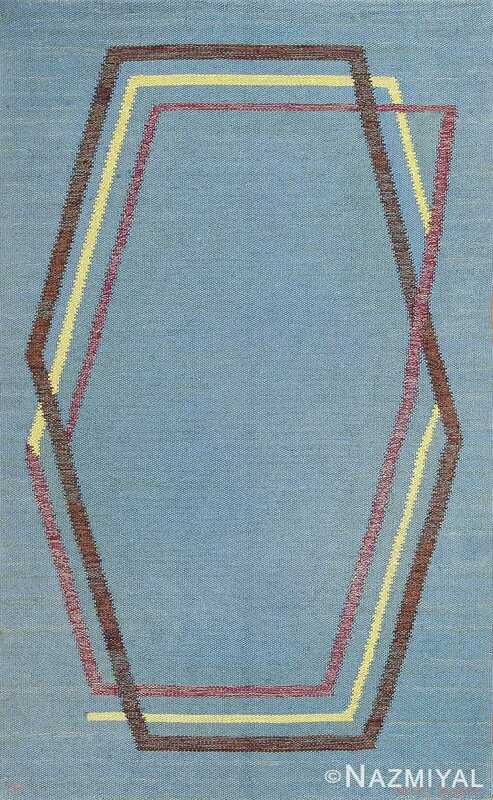 Later, she became the artistic director of the AB Robert Ditzingers weaving studio in Sunbyberg, Sweden. 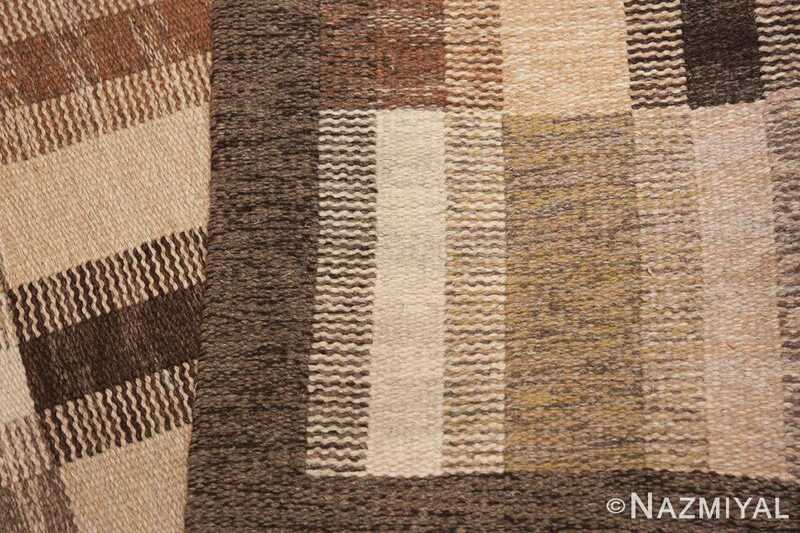 She was an experimental artist who produced her Swedish rugs using techniques including tapestry weaving, flossa, reliefflossa and rolakan throughout her many solo exhibitions. The entire design of this unusually large oversized rug is based on the rectangle. 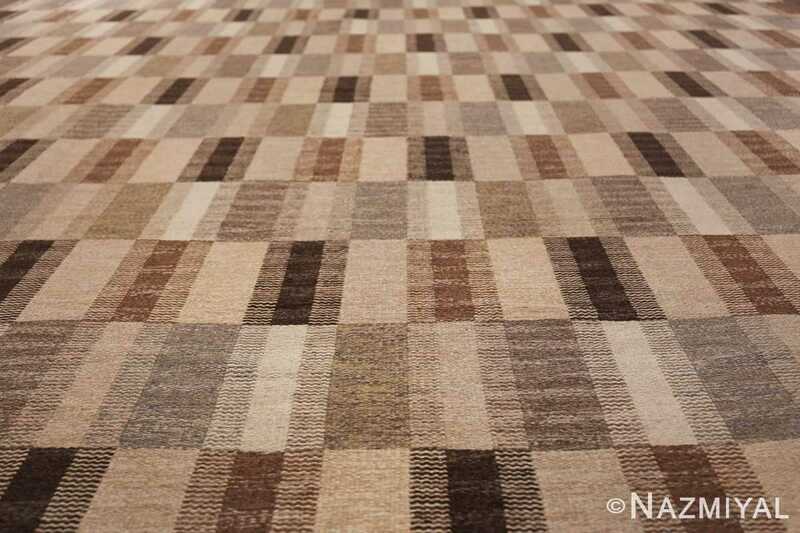 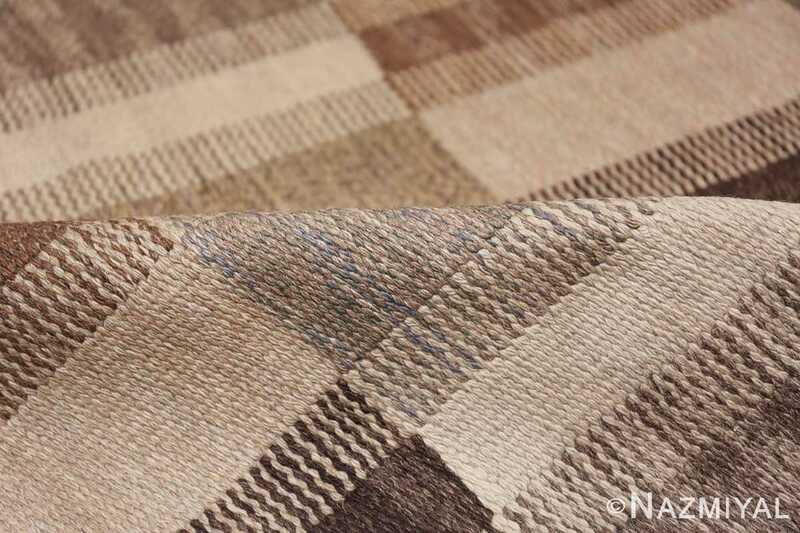 The design itself fits neatly within the rectangular borders of the oversize Scandinavian Brita Grahn Kilim rug. 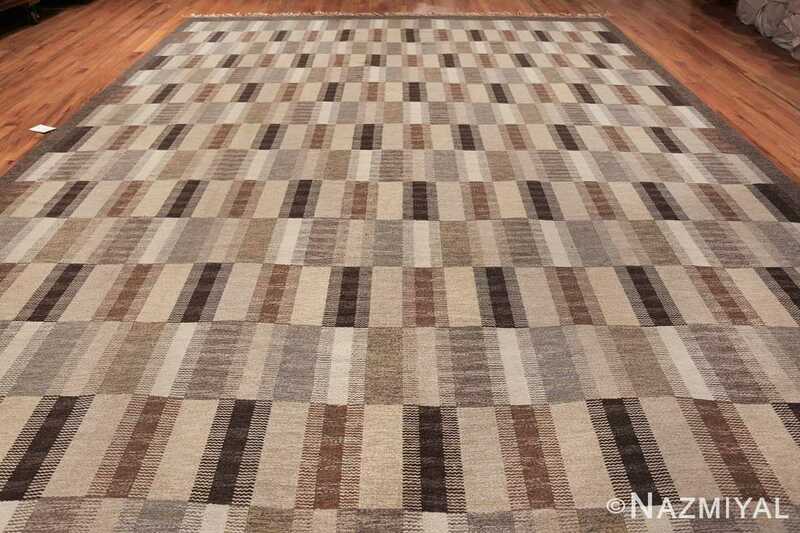 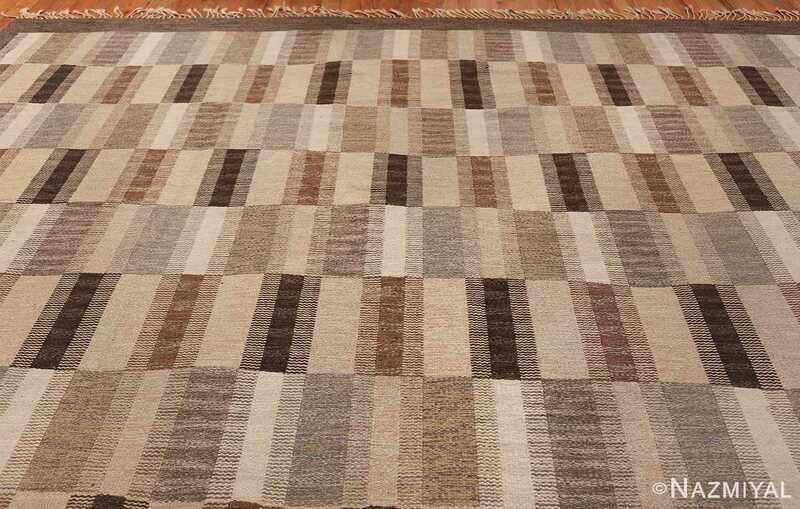 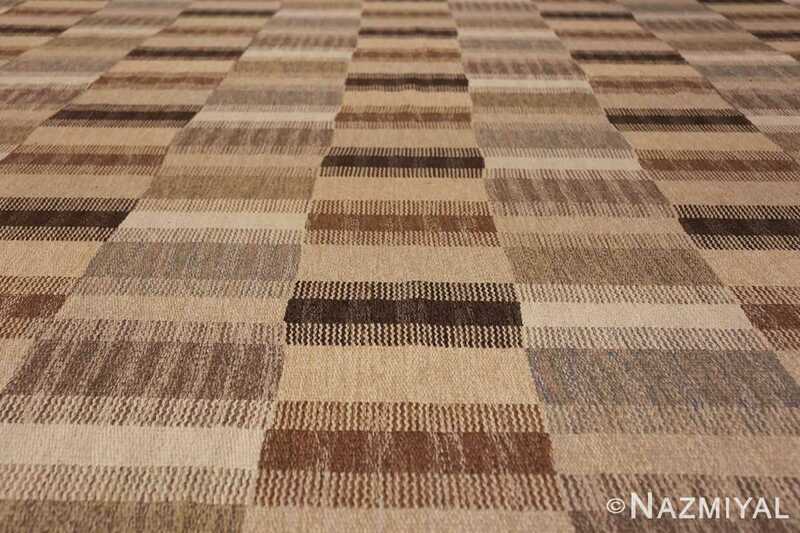 It is an all over design that appears to be two different layered horizontal bands all the way up the vintage mid century rug. This masterfully designed piece of textile art is versatile enough to complement rooms that are organically themed, industrial, or any other contemporary design. 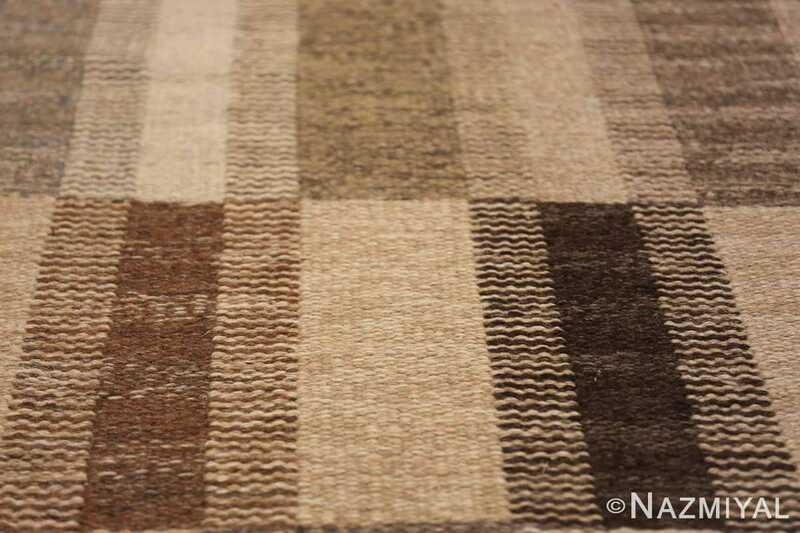 Its neutral earth tone colors and basic patterns make it ideal in many classic and traditional settings as well. The regular use of geometric shapes gives the oversize Scandinavian Brita Grahn Kilim rug a sense of order that helps to define the space. 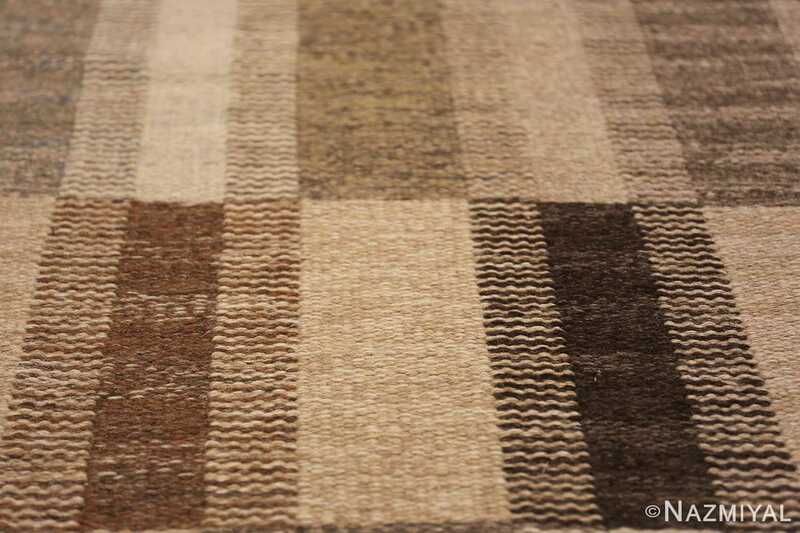 It also helps to give it a sense of predictability and tranquility. This is a beautiful example of mid century modern design from a famous artist and would make a beautiful complement to any earthy interior decor.